In the seventh pAsuram, parAnguSa nAyaki thinks “if we sent chEthanas [sentient – birds etc] as messengers, it is not helping the cause and they are abandoning me like emperumAn due to their having knowledge” and prays to her dolls “can you eliminate my sorrow?”. Subsequently, parAnguSa nAyaki our of her great sorrow tells some dolls ignoring that they are achEthanas (insentient) “Can you remedy my pale complexion by informing my words to emperumAn who is very beautiful, indwelling soul of all and the one who eliminates the hurdles of his devotees?”. See nanjIyar‘s introduction. She has become so desperate and helpless that she thinks even a doll can help her. pAvaigaL – Oh dolls (who remain here unable to bear my sorrow, unlike the birds who flew away)! thIrkkiRRirE – can you remedy? emperumAn is having complexion like pUvaip pU and eyes like lotus; he is able to remain aloof while having all achEthanas and chEthanas as body/form, and remaining untouched by their defects in those forms; he is the great benefactor who let me enjoy his beautiful combination of hand and divine chakra (disc), earlier; he is madhusUdhana who tore the very strong mouth of kESi, the horse; oh dolls! I am sinful to be forced to get my desire fulfilled through you. Telling him the words I taught to the parrots and mynAs, can you remedy my loss of fresh complexion? See vAdhi kEsari azhagiya maNavALa jIyar‘s translation. pUvaigaL pOl niRaththan – He has such beautiful complexion which makes a man become woman to pursue him. As said in SrI rAmAyaNam ayOdhyA kANdam 3.29 “pumsAm dhrushti chiththApahAriNam” (SrI rAma’s beauty will attract the eyes and mind of even men). He has such beauty that one will even fall at the feet of a doll to attain him. One who has the complexion of pUvaippU. puNdarIgangaL pOlum kaNNan – His body and eyes appear to be a flower growing out of another flower [as his divine body is compared to a flower too]; it appears that a lotus flower grew out of kAyAmpU (pUvaippU). He has such beautiful eyes which make every chEthana and achEthana fall at his feet. yAvaiyum yAvarumAy ninRa mAyan – When he pervades some [all], he becomes them. 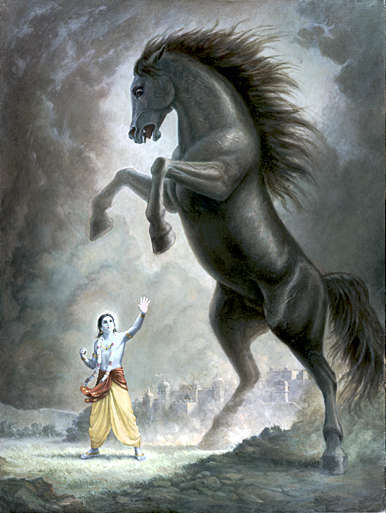 The one who remains the in-dwelling soul of chEthanas and achEthanas. thaiththirIya upanishath “thathsrushtvA thadhEvAnuprAviSath thadhanupraviSya sachchathyachchAbhavath” (He created everything and entered in them; by pervading them, he became the sentient and insentient entities); one who becomes indistinguishable when uniting [with his dear ones]. mAyan – While mingling in such manner, he remains without acquiring any blemish; while being the antharyAmi (in-dwelling soul) of all, being untouched by their blemishes as said in rig vEdham “anaSnannanyO abhiSAkaSIthi” (paramAthmA who is different from jIvAthmA is shining radiantly due to not experiencing the results of actions). While having the whole jagath (universe) as his body and being inseparable from them, he is untouched by the transformational quality of achith (matter) and the aspect of going through joy/sorrow by chith (soul). Here she is saying “yAvaiyum yAvarumAy ninRa mAyan” to indicate that just as he united with her and still remained aloof, he is present in all chEthanas and achEthanas yet being untouched by their blemishes; otherwise this is not required for the current context [of explaining her separation]. Now she is explaining the difference between “azhukkup padhiththa udambu” (his material body – i.e., all chEthanas and achEthanas) and “paranjudar udambu” (spiritual body, the divine form) [as indicated in thiruvAimozhi 6.3.7 ]. en Azhip pirAn – One who presented his distinguished form to me. After saying “yAvaiyum yAvarumAy ninRu“, she is saying “en Azhip pirAn“; this is how she became involved in his divine form. [Similarly] He himself said in thiruvAimozhi 6.9.1 “nIrAy nilanAy” (one who became water, earth etc) and then said “kUrAr Azhi veN sangEndhi adiyEn pAl vArAy” (you come to me carrying your sharp chakra (disc) and white Sanka (conch)). Except for the fact that everything is pervaded by bhagavAn and so he is called us “jagath SarIra” (one who has the universe as his body), would the samsAram be as desirable as his divine form? That is why his divine form is praised as being opposite of all blemishes as in “paranjudar udambu” (spiritual body, the divine form) and the universe is explained as mixed with blemishes as in “azhukkup padhiththa udambu” (his material body – i.e., all chEthanas and achEthanas) . mAvai … – Whatever comes as a hurdle to enjoy his beauty, he eliminates them; and that does not happen just occasionally [but always]. madhusUdhaRku – His eliminating of enemies is perpetual and not accidental like alphabets being formed as a worm crawls. en mARRam solli – Whatever I have taught you. pAvaigaL thIrkiRRirE – The paramachEthanan (supreme sentient) has abandoned me; these birds who have chaithanyam (consciousness) have not done the job; now, can you eradicate my sorrow? She is trying to get her task done considering their inseparable nature only. vinaiyAttiyEn – I have attained the sorrow of getting you to fulfil my desire instead of praising you; I have become greatly sinful to try and eliminate my sorrow which was caused by emperumAn who said in SrI bhagavath gIthA 18.66 “mA Sucha:” (do not grieve), with the help of achEthanas (insentient entities). pAsaRavu – sorrow. In the next article we will enjoy the next pAsuram. This entry was posted in thiruvAimozhi, thiruvAimozhi 6th centum on May 12, 2018 by Sarathy Thothathri.